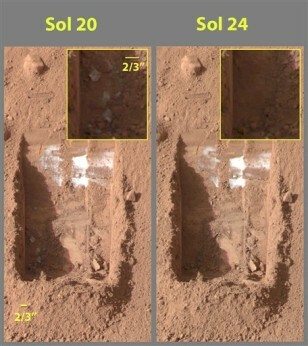 This combination of images provided by NASA's Phoenix Mars Lander's Surface Stereo Imager on June 15, left, and June 18, right, shows sublimation of ice in the trench informally called "Dodo-Goldilocks" over the course of four days. In the lower left corner of the left image, a group of lumps is visible. In the right image, the lumps have disappeared.